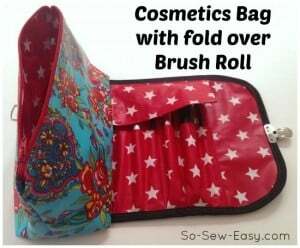 Do you remember that awesome tutorial and pattern that Anke shared for how to add a brushes bag section to the Easy Cosmetics Bag? I couldn't make up mine right away because I had to wait for my closures to arrive from overseas but I was so keen to give this bag a try. I just love it when people send in photos of things they've made with my patterns, and especially this one where it was such a big change from the original. This is my version – what do you think? Knowing how long her tutorial was, I had set aside a whole afternoon, but in fact, it went together very quickly. The tutorial was just long because she had been so very thorough and included great photos and instructions for every step. None of it is difficult or takes much time. Make much more sense to add on this extra section to the cosmetics bag, than carry round a second bag or brush roll. I'm loving it. I made a video as I went along, and this is my first time sewing the bag so I kept my fingers crossed the whole time, but there's nothing to worry about – it's a fun sew. I got my tuck lock from Pacific Trimming. Not tried the Frixion pens yet? You should – you can draw right on the fabric and then iron afterwards to remove it again. Great for this sort of project. I used the original instructions for the size of the pockets for my brushes and it was perfect. If you have more thin brushes, or a thicker one for powder, you could easily adapt it to make the right sized pockets for your brushes. I'll go back to the original article and add in the link for the video there too. 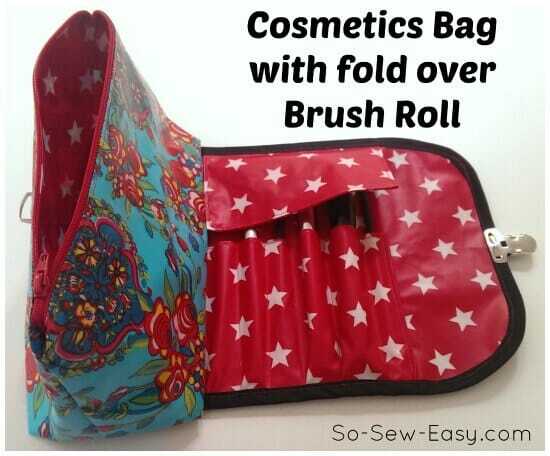 If you've not sewn the Easy Cosmetics Bag yet, give it a try! We've seen so many great results shared by readers on the Facebook page, and now with this new and expanded version you have a new reason why you should sew up another one. Know someone who needs one of these? Would make a great handmade gift idea or teacher gift, something for a niece, neighbour, girlfriend. Of course, assuming you sew it and can still then give it away. Too much of what I sew never makes it to the recipient – (evil grin). I've a feeling the person I had in mind for this bag will be getting chocolate for Christmas instead. 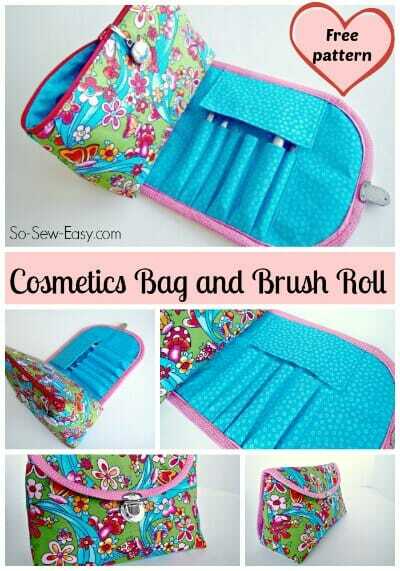 You can download the pattern and instructions for the Cosmetics Bag with Brush Roll from my design account at Craftsy. It's a PDF file containing both instructions and pattern all in the same file. Enjoy! Trouble downloading the pattern? Check out this article - How to Download and Print PDF Sewing Patterns. Just a tip about the Frixion Pens…if you are using a fabric that shouldn’t be near an iron, or have created a project where the pen lines are in “valleys” (think a sectioned stuffed rice bag) you can just as easily use your hair dryer! Works like a charm! Hi!! I am working on a modified version of this pattern that uses only 3 fat quarters. I was wondering if it would be ok for me to share my version of the blog I am creating? Did you end up modifying this pattern? I would be interested in seeing it. I was just wondering what size zip you need to use. it is all there in the turorial https://so-sew-easy.com/ankes-brushes-bag-free-pattern/ Enjoy! Hi Ruth, you can use a special online converter. I use this website – https://cm-to-inches.org/. Made this bag in a couple of hours yesterday, a wonderful bag and great idea – love it. Made from scraps from my remnant bin. The changes I made was to customize to brush pocket sizes to fit my brushes. Next step is to miniaturize this pattern to make a purse-sized bag for the quick touch-ups during the day. Please just email it to me at mayra@so-sew-easy.com and I’ll post it on the site. Will be great to see how you went. Hi Marie, Have you downloaded the pattern OK? I’m not sure what dimensions you are looking for, so if you can be more specific I’ll try to help. You should find everything you need in the download though. Thanks ! I took the pdf + pattern this page. At the end of pdf, there are dimensions, but it lacks that of the part “A”. There are B, C, D. I do not speak English and it’s hard for me to understand, sorry. Piece A does not have dimensions because it is a funny shape and a pattern piece is supplied for you to use instead. Fold your fabric in half, place the straight line of the pattern piece on the fold and then cut around the piece to get piece A. You will need two pieces the same to form the two outside pieces of your bag. I hope that helps. Thank you! This is such a cute bag! Love how the brushes fit at the back! How clever! You can download it for free Lisa. 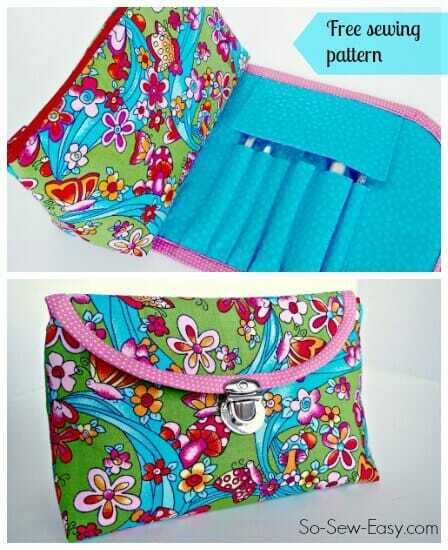 Just follow the link on this page where it says Pattern Download. That’s great Janice. Always makes me happy to hear when someone has success and loves what they sew, and if its an idea from here, even better! I do not know how to print the large patterns. I down loaded a dress and the crossover top but the top took 27 printed pages so I didn’t even try to print the dress. I managed to print some of your small patterns and have sewn several of your bags. I even felt encouraged enough to make a scissor case based on what I learned from your videos. How do I print the larger patterns? to print out the pattern at the right size to use it as the pattern to cut your fabric. In the same way when you buy a commercial pattern it comes on very large pieces of paper and you have to cut it out – those pieces are life size and just have to be that size. Generally, the more complicated the pattern, the more pieces there are, the more sheets of paper it will cover. So a small bag may only be a few sheets, but a full sized dress needs to be enough sheets to entirely cover your body in 3d. Put the pattern on a memory stick and take it to your local office supply store. Chances are, they have a giant printer, and can print it off on the big paper. Here it costs $2 per linear foot to print it out on blueprint or map sized paper. Thanks for the pattern! I’m going to modify it for watercolor pencils. 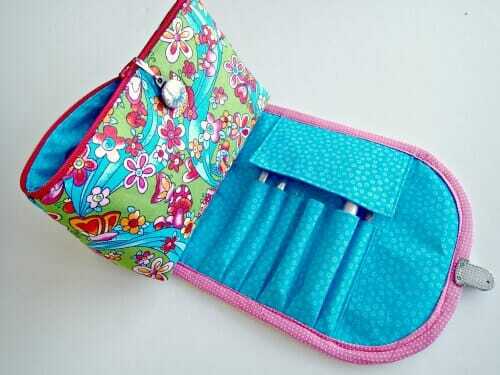 The bag will be for erasers, sharpeners etc. I have just started sewing and I found your blog through the Threading My Way linky party. 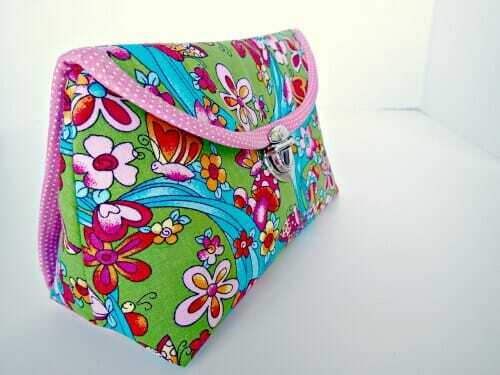 This little cosmetic bag is just beautiful and so very practical. I love that added brush roll. Brilliant idea. What a great gift idea! Thankyou for sharing! Congrats on being featured at Totally Tutorials, Deby! Great fabric choice. I think I’d be gifting chocolates, too! Yay, I was so waiting for your version of the bag, now finally it’s there – love it! Your colour choice is great 🙂 I am glad that it turned out so well. Your instructions made it all so easy. My bag turned out perfectly on the first try. Thanks Anke – its a hit!